Gripsweat - THE SYSTEMS "Where Did I Go" Channel "1" Records COR-702 Rare! 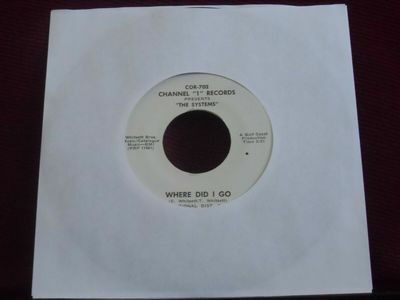 THE SYSTEMS "Where Did I Go" Channel "1" Records COR-702 Rare! I do combine on shipping. Please advise me when you are ready for a combined invoice. Where Did I Go/How High Is High Label: Channel "1" Records COR-702 Condition: Record is in near mint condition. Please note my grading policy below. Most items are visually graded as I simply do not have the time to play everything I list. I do realize in this hobby as I have collected now for nearly 50 years that sometimes things do not always appear as they seem. I do not want to sell any records that skip. Should you as a buyer receive a record from me that skips simply advise me and I will promptly refund the purchase price. Grading: NEAR MINT: Item is very clean, often looks near unplayed. Picture Sleeves will show little to no wear. VG+: Record may show light rubs or light scratches, may have a sticker on label or writing on label but vinyl should play and look very nice with minimal surface distortion. Picture Sleeves may show light storage wear, light ring or creasing. May have a label or light writing on sleeve. VG: Record is still quite nice but does look used and may have light scratches but nothing harsh. Should still play well with some surface distortion. Sleeve may show heavier ring wear, with possible tears, splits, fraying etc. VG-: Record will show definite signs of wear but will always play thru Good: Record will play thru but with significant surface distortion. May look ugly but will fill the gap in the collection until a better copy surfaces to replace it. Please check my other auctions for more great items. Thanks for looking and happy bidding!